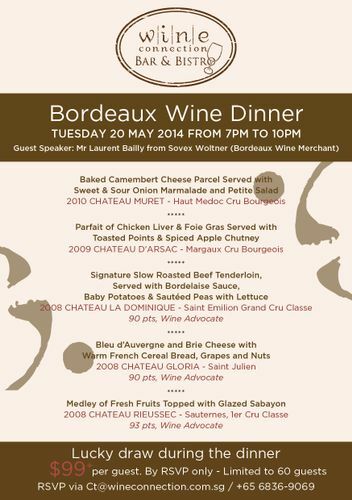 A five course Bordeaux wine dinner with wine speaker Mr Laurent Bailly, export manager for Sovex Woltner, one of the top Bordeaux wine merchants. He will be speaking about some of the highly rated wines featured in the dinner. Book by calling 6836 9069 or e-mailing ct@wineconnection.com.sg.